The hubbub is over. They came. They protested. They went. Janabalaya Kolambata - People’s Power to Colombo- had its political exercise, and the politics moves on, with the UNP celebrating the 72nd anniversary of its founding. The ‘Janabalaya’ message is one of uncertain political trends among the organisers, with a focus on the sharp revival of family bandyism in political leadership, and no message of any future policy changes for the people. Much of the concerns the government had about this much-publicised political move by the Joint Opposition (JO) seem unfounded. In fact, the government has cause to be pleased at the new strength of the democratic process in the country. The refusal by three magistrate’s courts for Police efforts to restrain the protesters, showed much of the independence of the judiciary today. 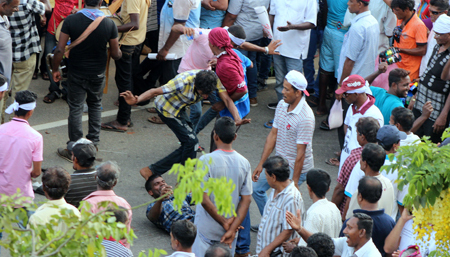 The ability of the protesters to gather at key city locations, showed a better organisation of civic activity by the authorities, and the freedom of democracy; in sharp contrast to the protest at Rathupaswala under the Rajapaksa regime, when several were killed. If the government can wear a decorative feather for the maintenance of peace in the city, it is not too late to think of having a better urban organisation to prevent obstruction to civic movement, while allowing the democratic right to protest. The management of civil and political protest in London UK, during the recent visit of President Donald Trump, is a good example. The protesters were very large in numbers, but the city moved on. ‘Janabalaya Kolambata’ had its own weaknesses. The crowd was certainly not as huge as promised. Confined to a limited part of the city, there was no organised rally for any expressions of political strategy or thinking. The fears of possible violence and major breakdowns in service led to most children not going to school, and most offices closing early to enable easy travel to employees. The organisers settled down to a so-called satyagraha near Lake House, which junction was the focus of action, leading up from the crowded Fort Railway Station area. As the sun went down, and political leaders moved to their five-star comforts, there was certainly a carnival mood. The organisers can take credit for the forehead bands that said where protesters came from, but such credit was lost with the drunken merrymaking, with a ‘satyagrahaya’ becoming a ‘sura-grahaya’. 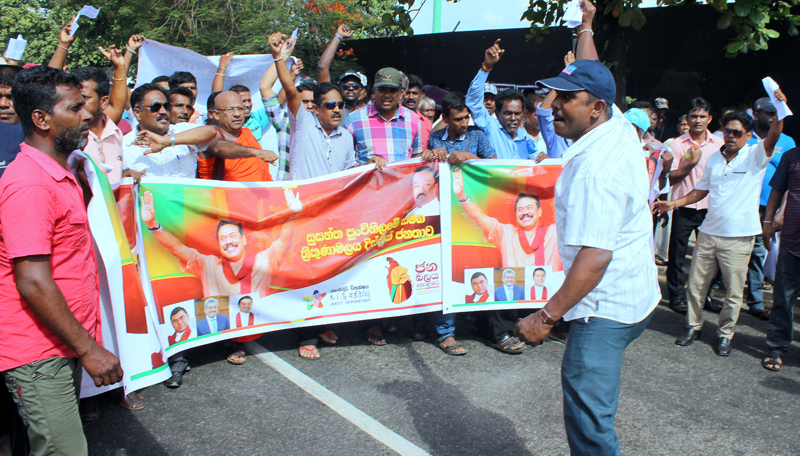 ‘Janabalaya Kolambata’ came after the five-day Kandy to Colombo Walk, also organised by Namal Rajapaksa in 2016, without its planned impact. That walk was to show the Rajapaksa strength within the SLFP, but there were too many political and tactical mess-ups on the way that the message was lost. There was a sharper message to Colombo, and the country from this week’s event. It was the demonstration of the Rajapaksa family in the politics of the Joint Opposition. The media did focus on the Rajapaksa siblings – Mahinda and Gotabhaya, and the son and nephew Namal. Minister Mangala Samaraweera had said this event was to have a ‘people’s chain’ to protect Namal, who faces several corruption charges in the courts. Such political analysis is good and interesting. Wednesday’s show was a wider display of Rajapaksa family politics or Pavul Havula in politics. The promise of more Raja Pavula politics once political goals are achieved. The absence of a rallying point with a meeting to address the participants and the country, was a show of the absence of strategies for the future, other than the Rajapaksa family. The popularity of Mahinda Rajapaksa was certainly unquestioned. Most participants were clear on that. However, Gotabhaya and Namal remained on the political sidelines. The message from Colombo was one of increasing concern about the rise in litigation against members of the former regime, especially the Rajapaksas and their agents, as long delayed inquiries are moving to the courts. The task for the government is to expedite setting up the other two Trial-at Bar High Courts, already approved by Parliament, and bring more of these probes to the judiciary. This is in keeping with the pledge given to the people by the Common Candidate, Maithripala Sirisena and the UNP-SLFP coalition in January and August 2015. Failure to tackle the issue of corruption effectively enables the JO to talk of revenge through the courts, while seeking to conceal the huge crookedness that prevailed. The Janabalaya came to protect the corrupt. Mahinda Rajapaksa’s most quoted line at Janabalaya Kolambata was that President Sirisena and Prime Minister Ranil Wickremesinghe are able to criticize him in Jaffna, because of what he achieved in the North, and the government is violating the independence achieved by defeating the LTTE, and the people’s democratic rights are violated by postponing elections. The comment on polls postponement is certainly a line of resonance, which the government should take note of. However, talk of the freedom to criticize him in Jaffna, has more than a touch of the racism that is part of JO and SLPP policy. Defeating the LTTE is certainly worth all honour. However, the failure to seek reconciliation and build genuine peace, moving toward majoritarian policies on race and religion, is something that weighs down his political neck, and is the promise of this organised Janabalaya, too. While even the limited success of its demonstration and so-called satyagraha could be encouraging to the JO and to Namal Rajapaksa, one must note that much bigger rallies and demonstrations, especially by the left parties in the past, did not bring about the political changes they promised to the organisers. The active participants in such political shows are able to influence public opinion, but only to a limited extend. The changes in a democracy come from voters, and not entirely from the walkers and ‘satyagrahis’. It is important for both the JO and the Government, especially with its divided coalition, to think of the impact this has on the Nihanda Bahutharaya – the Silent Majority. This is the effective force, especially in the context of divisive politics, in electoral democracies. Wednesday’s ‘Janabalaya’ had a limited impact on Colombo, carried wider through the media. It certainly does not show the overall acceptance of a repeat of the Rajapaksa authoritarianism and near dictatorship, by the silent majority of the country. It is near farcical to hear Mahinda Rajapaksa talk of the country heading towards an autocratic form of governance rather than democratic rule. Holding a mirror to himself, brother Gotabhaya and son Namal, will show what autocracy and authoritarianism was in this country, with regular and even purchased elections. Give more strength to the fight against corruption. More probes, more charges, and more to the courts, is the call of the Silent Majority, when the JO/Rajapaksa alliance has no new message to the people. As the United National Party celebrates its 72nd anniversary, there are more divisive trends in the politics of the ruling coalition. Sections of the SLFP seek closer links with the SLPP and Mahinda Rajapaksa. These trends are making the UNP to strengthen its unity within the government, with Gam Peraliya moves in the rural sector and increased moves to influence the urban sector with more business policies and investment. The UNP remains a right wing, pro-capitalist, and neo-liberal party, which is the line of its leader Ranil Wickremesinghe. It has challenges when moving towards the coming presidential and general elections. How can it keep its voters who supported Maithripala Sirisena as the Common Candidate for the Presidency in January 2015, and increase its voter base moving away from the disadvantages of the coalition of unity? The party has a major disadvantage with its association with the Central Bank Scam, especially that of Arjuna Mahendran being its choice for the office of Governor. The delays in Arjuna Mahendran coming before the courts, despite an Interpol warrant, is certainly a disadvantage to the UNP. What it needs to demonstrate when moving to the final stage of current coalition politics, is how it can present itself as a political party with a national following, which can weaken the rising impact of the SLPP, and can it draw support from what is left of the SLFP? The next presidential election, any time after January 15, 2019, is the issue of importance to the UNP. How far can it emerge, as a single, independent political party with a strong candidate for the presidency, and an effective winning of seats in the next parliament to have its own Prime Minister are the political challenges today? Ranil Wickremesinghe remains the unchallenged leader of the party, with a political record in a leadership position. Have changes carried out in recent party reforms been effective to meet the challenges of a revived Rajapaksa family move to power? How much can it retain the support of minority voters? And, how much of the new youth vote can it draw in the coming years? Moving away from a common candidate for presidency after nearly 15 years is the stumper for the UNP leadership today.